The choice of network cabling (or communication medium as it is sometimes called) is rather important because of the extremely high frequencies of the signals. Sending a 60-cycle utility power through a wire rarely presents a difficulty; but sending a 100 million bits per second signal can be a little more tricky. For this reason, the method of sending signals and the materials they are sent through can be important. 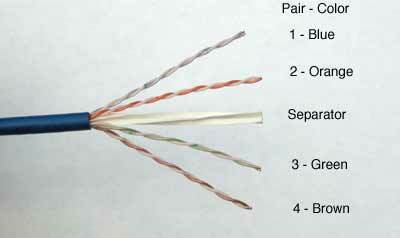 A number of cabling options are available for networking connections. Unshielded Twisted pair (UTP) - UTP cable is the primary cable used for networks, as specified in the EIA/TIA 568 standard. This cable type has been widely used because it is inexpensive and simple to install. Limited bandwidth (which translates into slower transmissions) has pushed development of new cable grades (the "cagegories" of 568) but has created a more expensive product and more complicated installation process. Screened Twisted pair (ScTP) - Same as UTP with an overall shield around the 4 pairs. While not currently specified for any networks, it is allowed in the EIA/TIA 568 standard, it is used in many networks in Europe where EMI is a greater concern. It tends to be more expensive, harder to terminate and requires special plugs and jacks. Shielded Twisted Pair (STP) - Like UTP but with a shield around every pair. Widely used in IBM systems (IBM Type 1 cable) and included in 568. Coaxial Cables - Original Ethernet, used in CATV systems. This is familiar and easy to install, has good bandwidth and lower attenuation but more expensive, bulky. Not included in 568, but in 570 for residential use. Optical Fiber - Optional for most networks, top performance, excellent bandwidth, very long life span, excellent security but slightlly higher installed cost than twisted pair cables, more expensive electronics interface to them. Fiber can be cost efffective with optimal architecture. See Lennie Lightwave's Guide To Fiber Optics. Wireless - no data transmission cables are reqired to connect any individual terminal, but requies cabling to every antenna (called an Access Point), so it's hardly "wireless"!. Within the range of the radio signals, a terminal can be moved anywhere. Usually more expensive but used in locations where is would be difficult to install cables. In the modern network, wireless is a requirement because so many users want "mobility" - so they are not "tethered" to a desktop. Infrared Transmission - Also transmits without wires to the terminal by using infrered (IR) light but each transmitter requires cabling. By sending pulses of infrared light in the same patterns as electronic pulses sent over cables, it is possible to send data from one place to another. Networks based on IR transmission have been developed for use in office and for line-of-sight transmissions between buildings. Powerline or Phone Line Transmission - Networks using available cabling with mixed results. UTP cable is comprised of four pairs of carefully twisted pairs of copper wire, insulated with carefully chosen material to provide high bandwidth, low attenuation and crosstalk. UTP cable works so well because it is used with transmitters that work on "balanced transmission." They transmit equal but opposite signals on each wire of the pair so each wire has only half the amplitude of the final signal. The electrical and magnetic fields of each wire are opposite and cancel out eachother, producing low electromagnetic emissions. Likewise, electromagnetic pickup is the same on both wires so they cancel out. We'll say it here and many times more before we're through - the secret ingredient of Cat 5e/6 is the twists! In order to maintain Cat 5e/6 performance, especially crosstalk, you absolutely must keep the twists as close as possible to the terminations! The cable is terminated mostly in jacks, connector receptacles that have punchdown terminations on the backside and tricks inside to prevent crosstalk. See Terminations. Some snap into work area outlets, others are incorporated in rack mount patch panels. 568 allows many possible cable configurations, including intermediate punchdowns, but a direct run from a work area outlet to a patch panel will provide the highest performance, likely necessary if upgrades to fast networks like Gigabit Ethernet are contemplated. Patchcords for connecting network equipment to the outlet or patchpanel are usually purchased factory-assembled. The connector (plug) is properly called a "modular 8 pin" but usually is referred to as a RJ-45, which is actually a specific telco use of the same plug. They use stranded cable for flexibility and require special connectors. Order them to proper length if you can to prevent the mess that patch panels often become after a few moves and changes. Right now, you can get hardware and cable rated for Cat 3, Cat 5e or Cat 6. With cable, it's easy to see the difference; it's in the twists - higher performance cables have more twists. But jacks are harder to tell the differences. Trust us - they are different. 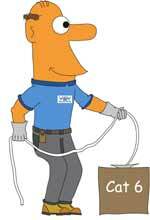 If you terminate Cat 5e cable with Cat 3 jacks, you will get Cat 3 performance - no better! When dealing with Category 5e and Cat 6 designed to support Gigabit Ethernet, termination procedures become even more complicated! Here's a guide to the diferences in the categories. Like everything else that deals with computers and communications, the speed of networks keeps going up. Cat 5e is OK to handle one gigabit networks, but the EIA/TIA TR 42 committee that writes the cabling standards (the same "568" we referred to earlier) approved the standard for Cat 6 cabling in June of 2002 after three years of debate, discussion and testing. It never found a real use. When 10Gigabit Ethernet came along, it required a higher performance cable, augmented Cat 6 or Cat 6A, specified to 500 MHz. This standard includes cables, plugs and jack, patch panels and patch cords, in other words, everything you need to install a complete cabling system. Performance specifications for Cat 6A are for significant advances over Cat 5e or Cat 6. This leap in technological advances, like all previous ones, comes with a cost. The goal of the committee is that each generation of Category-rated cable be "backward compatable" which means that any networking product that works on Cat 3, 5, 5e or 6 is supposed to work on Cat 6A. The other issue that the group wrestles with is "interoperability" - mixing and matching components. This part of the standard states that cable plant containing mixed categories (eg: Cat 5e patchcords on a Cat 6 cabling systems) is supposed to work without compatibility issues, but will only work at the level of the minimum component specification (Cat 5e in this case). Finally, there is the issue of compatibility among different manufacturers products. Practically everybody told users installing "pre-standard" Cat 6A to stick to one manufacturer's products or those tested for compatibility. That worried users so much the EIA/TIA press release on the Cat 6 standard stated: "To ensure generic cabling system performance, Category 6 component requirements are specified to be interoperable when products from different manufacturers are mated". The same issue probably exists with Cat 6A. The word from insiders, however, is that there are some details still to be ironed out. And while the Europeans are working on Class F - a 600 MHz cabling system (what some US vendors tout as "Cat 7"), the EIA/TIA TR42 committee has so far declined to consider such a standard in the US due to lack of interest from the network development committees. The performance of the cabling network is heavily dependent on the installation. The components used in structured cabling installation have been carefully designed and exhaustively tested to meet or exceed the requirements of EIA/TIA 568 for performance. If the cable is not properly installed, performance will be degraded. See the page on installation for more tips.